Archive for the ‘Tech Testing’ Category. In the Southwest, Technology Testing, the training arm of Marco Crane and Rigging, Phoenix, Ariz., hosted the Regional Qualifying Rodeo, an event brought to the industry by MCM Events and partner CIC. Jim Headley, owner of Crane Institute of America, judged the competition, as well as Larry Curtis of Construction Risk & Safety Management Associates, Yuma Ariz., and Jameson Headley. Operators from Arizona and Southern California participated in the competition, which required operators to perform timed tests like lowering the headache ball into a barrel and lifting and turning a pipe in a certain area. James Kinnard, who is currently working a major power line project for Parr Electric near Barstow Calif., brought his family to watch him compete. “I have thought for some time that there needed to be something similar to the Lineman’s Rodeo and was really excited when I heard about this event,” he said. Scores were very close until Marco’s John Seach jumped behind the controls. After returning from a day-long project in 108 degree heat, Seach was concerned that he wouldn’t be at his best. Not only did he score a perfect scoure on the course, but he did so in 3:39—nearly three minutes faster than second place finisher Jesse Pettit of Maxim Crane. Seach is a journeyman operator who started with the Local 324 in Detroit 38 years ago and has operated virtually every size and type of crane. 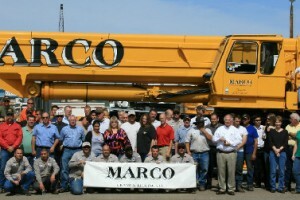 He moved to Phoenix about five years ago, where he has been one of Marco’s top operators. Pettit has been an operator for about 10 years for Maxim Crane in Phoenix. He also scored a perfect score. His time of 6:18 was 20 seconds faster than Frankie Estrella of Tucson, Ariz., who scored the only other perfect score. The top two finishers will travel to Orlando on Oct. 27-28, where they will compete in the Crane Operator Rodeo National Championship, where the top operator will be named.